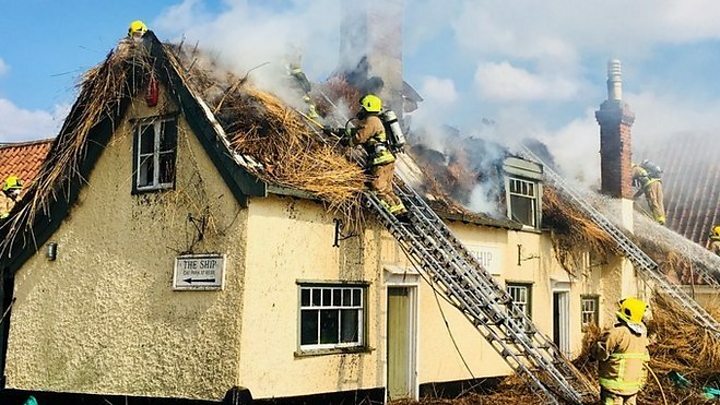 Almost 50 firefighters from two counties have tackled a "significant fire" at a historic pub, which dates from the 13th Century. The thatched roof blaze broke out at The Ship, Levington, near Ipswich, at about 09:30 GMT. Suffolk Fire & Rescue Service confirmed it had sent 16 appliances to the scene, while fire crews from Essex have also been drafted in to battle the blaze. Nick Attfield, from the pub's owners Adnams, called the fire "devastating". On Twitter, the fire service said that crews were expected to remain on the scene for the rest of the day. Several road closures are also in place. Group commander Nigel Vincent said crews had tried to "strip the thatch back to stop the spread of the fire into the main building". It is not the first time there has been a blaze at The Ship Inn, which overlooks the Orwell estuary between Ipswich and Felixstowe. The pub was closed for two years after a fire destroyed the thatched roof in 2001. Mr Attfield, director of pubs, inns and hotels for Southwold-based Adnams, confirmed all staff were safe, but said: "It's obviously devastating to see such a beautiful, iconic pub in the state it is."